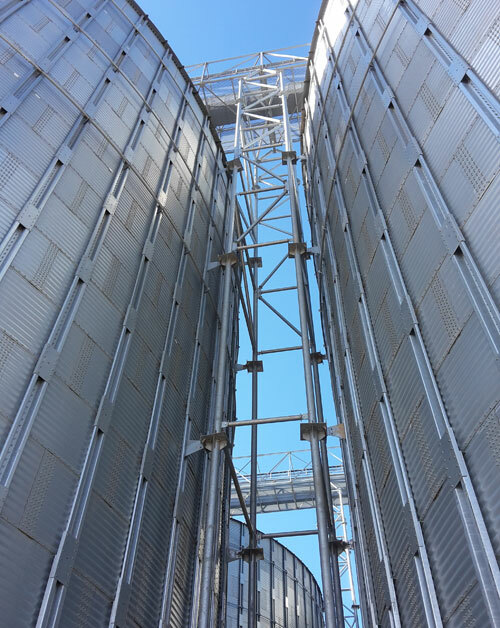 To support loading equipment and easier silo floor maintenance and operability, there are different types of catwalks available depending on the span, distance to the ground and load supported. The design is modular with bolted joints. They are designed for people to pass through or as a support for mechanisation up to 2,000 T/h. The dimensions range from 80 mm to 3500 mm wide with an anti-slip floor and protective elements pursuant to standard UNE-EN ISO 14122. The available catwalk options are: Open, tunnel closed, with lattice or laminate structure. The lateral support is bolted to the silo stiffeners. Used for light machinery in silos of up to 24 m in diameter. Additionally, an oblique support can be added to the lateral support depending on the silo and catwalk model. The support towers are specially designed to bear the loads from the catwalk by transferring them to the foundation directly. Intermediate towers between silos as catwalk support: 2×1 metre ground surface. Towers in an exposed position: 2×2 metre ground surface. 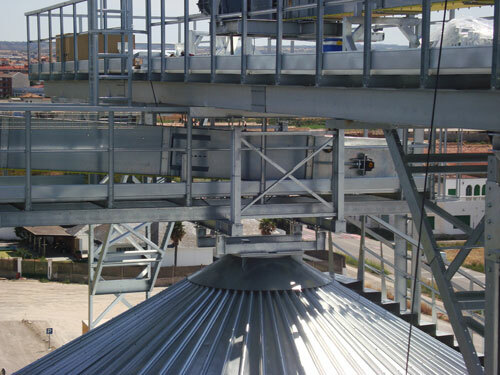 Supporting towers: double T beam and steel sheet catwalks. 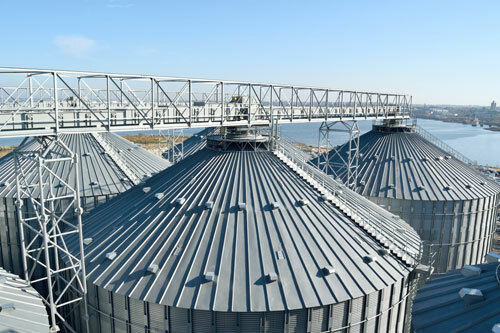 The cap support supports the catwalk and is placed above the top cover of the silo roof. There are different types based on the machinery performance and type of catwalk. 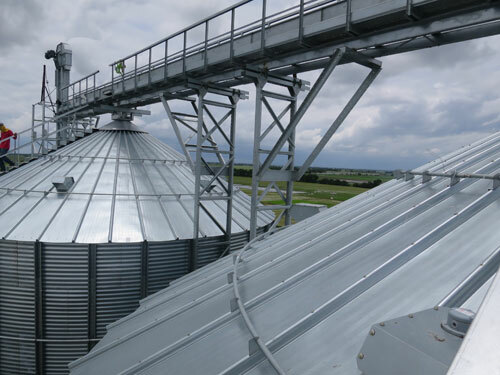 Rest platform on silo hatch is an optional element and fosters the connection supervision work between the machinery and the silo. 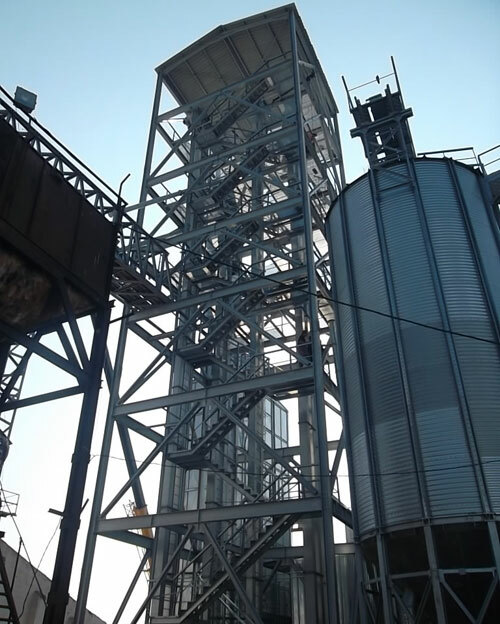 Elevator towers are modular bolted and welded structures made with double-T laminate profiles in galvanised steel. They offer stability, easy access to the catwalks and make for safer elevator maintenance. With a floor that can be walked on, electro-welded grating and maintenance platforms including securing tensioners. 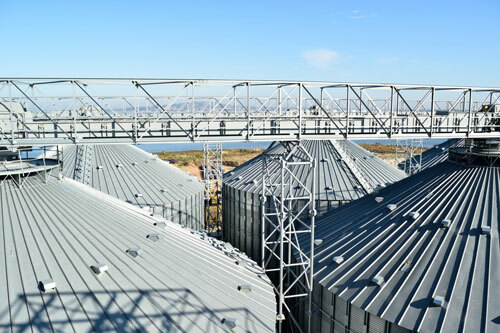 Facilities where the grain reception is centralised in a group of hoppers. For processing towers with reception, weighing and cleaning.